Crafting With Craig: Linen and Love, Anniversary Wishes 8x8 card. A Wedding can possible be one of the most special events in a couples life. Whether it's you getting married, or a loving couple that you know. It's the start of many many years of happiness (hopefully) and with each year that passes, anniversaries are such a perfect way to acknowledge their love for one and other. It's one of the few occasions where you really want the card you will be given to be exceptionally special, after their wedding or birth of their first child or any child. The base core of the card really is relativity simple, just some basic matting and layering. The 2nd base is measuring 6"x6" and has been embossed using an embossing folder, this is one step that doesn't have to be. The 1st base is measuring the card size of 8"x"8. The die cut heart has had the outer outline shape die cut first and then before adhering the inticuit die cut elements, I have run the outline shape through am embossing folder first, this time being differnt from the 2nd base embossing folder. Then making up 6 flowers using petal pair punches from Tonic Studio in coordinating colours - Ivory Linen and Gold mirri. 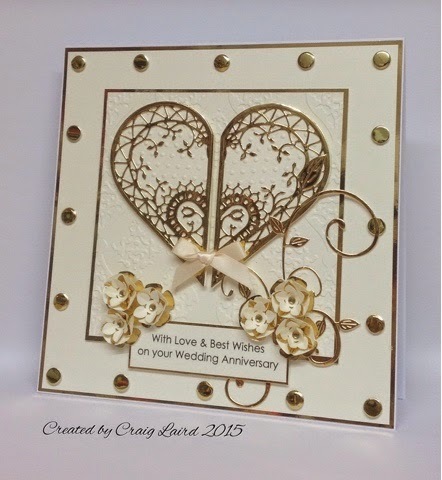 I Added a couple of die cut swirls, ribbon, Gold card candi round the edge and a sentiment all to complete your card. As you can see, you can run the Ivory Linen card through your printer with no problem. This would be a gorgeous card for a wedding, Valentine's or even a birthday card. Hearts really can be suitable for all different celebratory occasions. A4 magnetic storage sheets (1 pack)- S57264. 4mm gold gems - Mei flower.